So many column inches have been devoted to the cronut in New York, but did you know you can get a cronut knockoff in London? 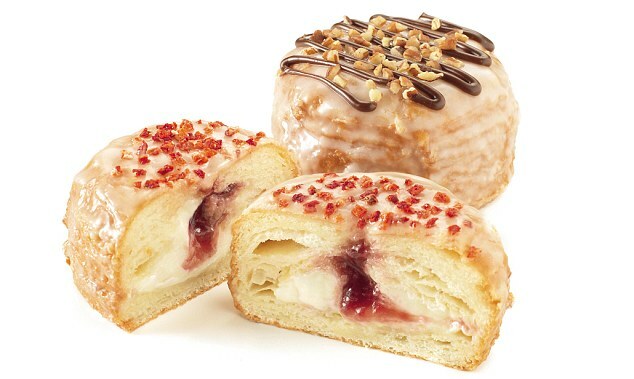 I’ve just discovered that Greggs Bakery, of all places, has launched this half croissant, half donut hybrid in its London stores and christened it the “greggsnut.” It’s available in berry and caramel-pecan. Posted on 4, December 2013, in Food and tagged croissant, cronut, donut, doughnut, eating, food, Greggs Bakery, Greggsnut, London, New York, sweet. Bookmark the permalink. 4 Comments. That is hysterical!! I’ll think of that next time I see a WH Smith’s or a Greggs (which really is a guilty, disgusting pleasure. We always go there at least once on any visit to the U.K. and then are filled with regret afterwards). I’m definitely trying it next time we’re in London!